February is a month that usually pushes me into self-reflection. My birthday just passed, I'm again another year older and the younglings around me are starting to get extremely excited for the day; Valentine's Day. While I no longer share the same excitement towards Valentine's Day (seriously, we just survived and recovered from Christmas), the days leading up to it makes me reminiscence of my past. 15 years ago, I would be panicking to find a date for the so-called special day, 10 years ago I was convinced that my life was over because I was a year away from 30 and 4 years ago, I was heavily pregnant with little tyke and Valentine's Day was the last thing on my mind. This year? Well, I am all about celebrating self love and appreciating who and what I have hence I am currently also on a journey of rediscovering my beauty stash. In today's post I'll be sharing my little me time and which products I reach for whenever I want to spoil myself. I have been perfectly content with my holy grail Le Petit Marseillais body wash (reviewed here) but let's be honest, we all need a special treat for a special day. Bodycology Sweet Love Moisturizing Body Wash* (C$6.97) is new to me and honestly it took me ages to give it a try because well, I am a body care snob. This little gem totally blew me away from the first use. It smells refreshingly like a garden of roses and it's one of the most moisturizing body washes that I have ever used. It leaves my skin silky soft and it has garnered me compliments whenever I use it. This has been my go to whenever I want my skin to look and feel soft and supple and it's perfect for a special day. Yardley has been featured here before and there is a good reason why it's being featured here again. Yardley English Rose range is the reason why I embraced rose scent after spending most of my life hating it. If you remember my previous post (read here), I was not a fan of the body lotion. It was too lightweight for my liking and the scent was also overpoweringly sweet so I gifted the bottle to my best friend. She absolutely loved it and thought I was bonkers to dislike it. When this lotion came back into my life recently, I decided to give it another try and fell madly in love with it! The texture is luxurious and for some reasons I don't find the scent to be as overpowering anymore. 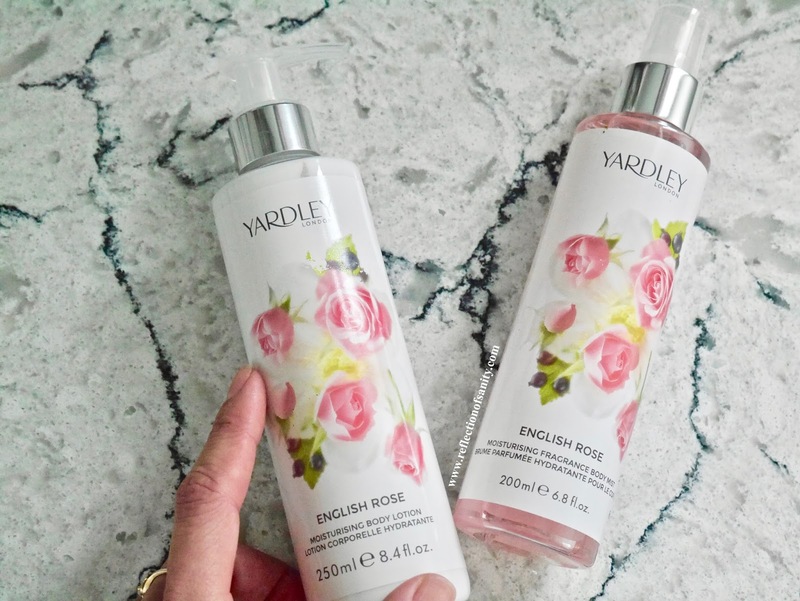 I have been loving the combination of Bodycology Sweet Love Moisturizing Body Wash*, Yardley English Rose Body Lotion* (C$9.99) and English Rose Body Mist* (C$12.99) as it leaves my skin feeling, looking and smelling like a million dollars. As most of you already know by now, I have a very good and extensive skincare routine but I do reach for a few special products for special occasions. It will not be a special occasion if I don't reach for Lancer The Method: Polish (reviewed here). This scrub is my first step to beautiful, radiant and renewed skin. In short, it's amazing at cleaning my pores, getting rid of dry spots and I swear my skin looks and feels firmer too. 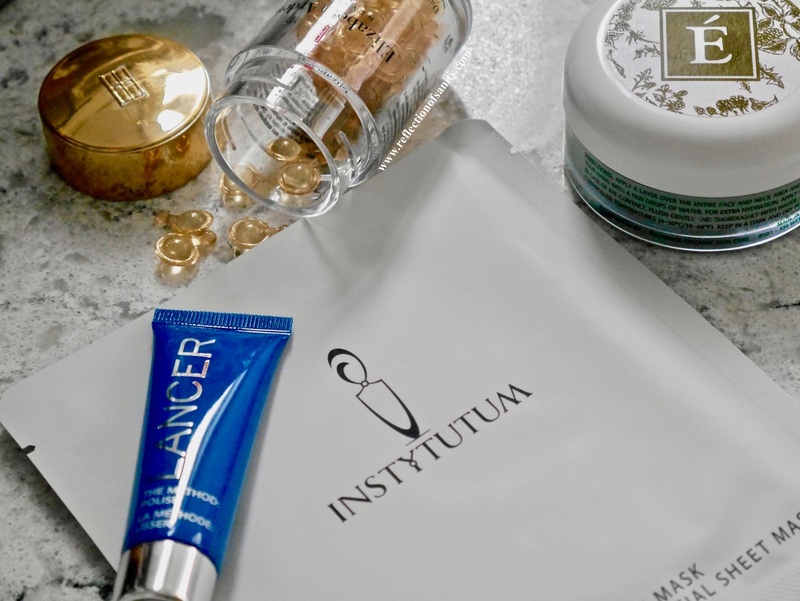 To make sure my skin looks plump, supple and hydrated, I will reach for my holy grail sheet mask, Instytutum Flawless Skin Mask* (reviewed here). This is the sheet mask of all sheet masks and it leaves my skin looking bouncy and plump after just 30 minutes and the effect lasts a few days after too. The crazy price is the main reason why this mask is reserved for special occasions but if I ever win the lotto then I would be more than happy to use it 3-4 times a week! I admit that I am not the biggest fan of Elizabeth Arden skincare. Personally I feel like the price range is grossly inflated and I don't think the products, especially the Prevage range, is anything out of this world. All that aside, I do find the Ceramide range contains some gem and the cult favourite capsules for face and eyes are worth the price. What makes these capsules amazing is there is no water in the ingredient list so you are getting an undiluted blend of goodness and for that reason, I absolutely love the capsules. Elizabeth Arden Ceramide Eye Capsules are one of the main reasons why I managed to prevent the fine lines around my eye areas morphing into wrinkles. One capsule contains too much product for the eye areas alone so I usually use the remaining serum on the face and I always wake up looking like I had the best sleep in my life. 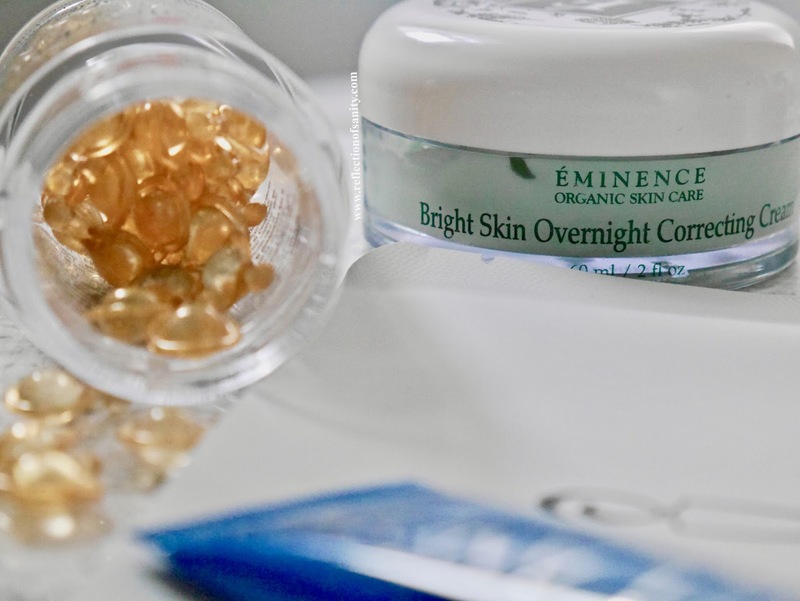 Éminence Bright Skin Overnight Correcting Cream* (reviewed here) is one of the most luxurious, hydrating and brightening creams that I have ever tried. It contains Ubiquinone (Coenzyme Q10), Salicylic Acid, Lactic Acid and a potent blend of plant extracts. I keep this cream in the fridge and scoop with a clean spatula to prolong it's life span and only use it when my skin needs an extra 'perk me up' and whenever I feel like spoiling myself with a home spa experience. The combination of all the products above give me the best skin that would last almost the whole week! I wish I could afford using everything regularly but for now, these are my precious little treats for a very special day. 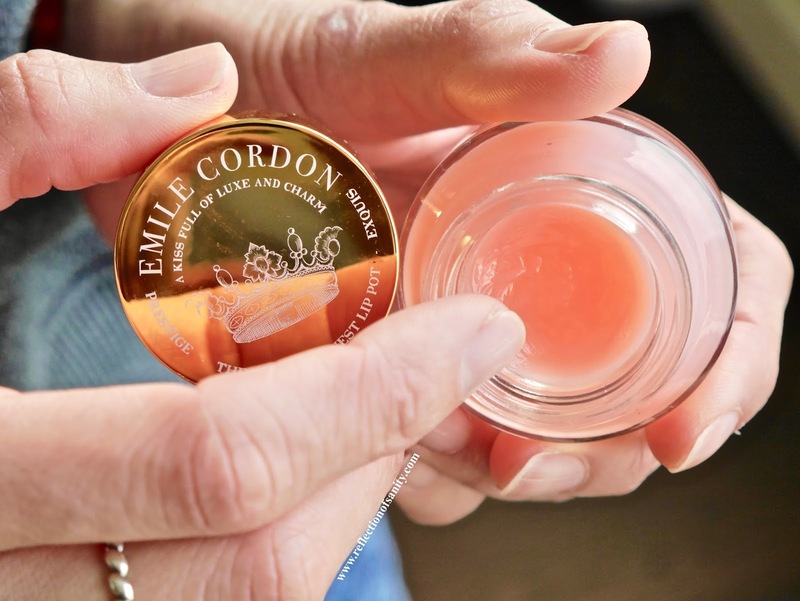 Now I couldn't end this post without sharing my most luxurious lip balm, Emile Cordon Lip Pot No.1 Lisa* ($42.00) (reviewed here). No.1 Lisa* is blended with a delicate of Rose Champagne, and contains Evening Primrose and Vitamin E, this multi-purpose balm nourishes my lips like no other. Not only does the balm have a smooth, luxurious texture, just holding the beautiful glass jar in between my fingers make me feel like a princess. What better way to treat myself than this little magical pot? I feel like the older I get, the more I appreciate the little precious moments when I can celebrate the most important people in my life. Mr. Platt and I won't be heading out for an overpriced dinner, squashed into a small dining place crammed with 3 tables too many diners instead, I'll be preparing his and Little Tyke's favourite meals to celebrate the day. It's a celebration about love and that for me is my family and myself. Are you celebrating Valentine's Day? What are your special plans for the day? *Products marked with * were received for free but my thoughts and opinions are 100% unbiased, honest and my own. There is no place for any sort of BS here.